But per capita meat consumption remains relatively low. This has implications for nutritional and food security. In the eyes of the world, India is seen as a vegetarian country. Presumably, this impression has been created by our best brand ambassadors from political, spiritual and yoga circles. Prime Minister Narendra Modi is a strict vegetarian. The popular yoga guru, Baba Ramdev, and many other Hindu religious leaders too, are vegetarians and preach vegetarianism. But what is the reality? To know this, we dig into India’s largest household consumption surveys conducted by the National Sample Survey Office (NSSO). They were conducted in 1993-94, 2004-05 and 2011-12, each time with a sample size of over one lakh households, with a one-month recall period. We define non-vegetarians as those consuming either eggs or fish or meat or any combination of these. By this definition, 62.3 per cent of Indian households consumed non-vegetarian food in 2011-12, up from 56.7 per cent in 1993-94, and 58.2 per cent in 2004-05. So the trend is quite clear — non-vegetarianism is on the rise. The Sample Registration System Baseline Survey 2014, however, states that 71 per cent of Indians were non-vegetarians as on January 1, 2014. But this study covers only that segment of the population which is above 15 years of age; the NSSO survey includes individuals of all age groups. Hence the two are not comparable. Which state has the most vegetarians? If you are thinking of Gujarat, the home of Gandhi and Narendra Modi, think again. While 28 per cent of Gujarat’s population eats non-vegetarian food, Punjab has an even lower percentage (23 per cent) of non-vegetarians. Haryana, however, has the lowest non-vegetarian population in the country with just 19 per cent non-vegetarian households, and has remained so since 1993-94 (see map). A state-wide analysis shows that seven states in the Northeast had the highest proportion (97 per cent) of non-vegetarians in 2011-12, followed by West Bengal (95 per cent) and Kerala (92 per cent). At the other end, Haryana is followed by Rajasthan (20 per cent), Punjab (23 per cent) and Gujarat (28 per cent). There has been a sharp increase in the proportion of non-vegetarians in Jammu and Kashmir — from 35 per cent in 1993-94 to 71 per cent in 2004-05. 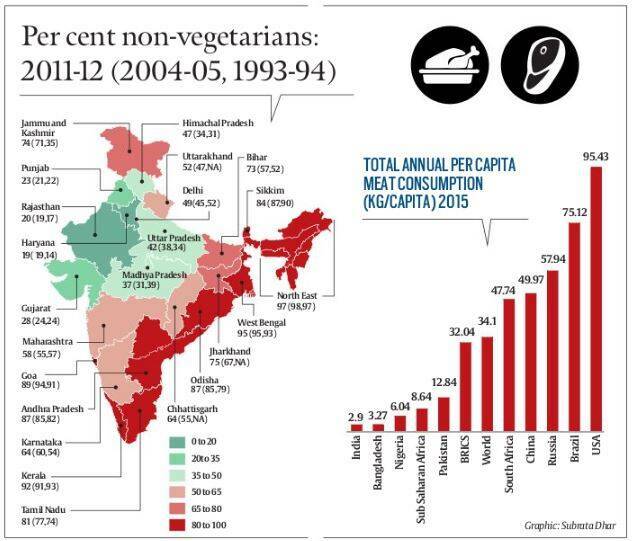 The percentage of non-vegetarians in the state increased to 74 per cent in 2011-12. The sharp increase is, presumably, due to the exodus of Hindus from the state during this period. While the trend toward non-vegetarianism is clear, what is interesting to note is that it has been marked by a “chicken revolution”. The proportion of households consuming chicken shot up from eight per cent in 1993-94 to 38 per cent in 2011-12, while that of the fish-eating households increased marginally from 30 per cent to 32 per cent over the same period. The proportion of goat-meat/mutton-eaters has fallen significantly — from 30 per cent in 1993-94 to 15 per cent in 2011-12. The population of beef and buffalo meat-eaters has remained more or less constant at about six per cent over this period. Interestingly, the proportion of so-called “eggetarians” (those consuming only eggs) has fallen drastically from about 24 per cent in 1993-94 to merely 3.5 per cent in 2011-12. A structural change in the poultry industry by organised large hatcheries like Venkateshwara and Suguna — who have mainstreamed small holders — seems to have ushered in the “chicken revolution”. As a result, broiler meat production rose from less than 0.2 million metric tonnes (mmt) in 1991 to about 2.47 mmt in 2011-12, and egg production from about 24 billion to 66 billion by 2011-12. Also from the Op-ed section: Badri Raina writes – Who owns the nation? Religious movements in Punjab — Arya Samaj, Radhasoami and Namdharis — seem to have played an influential role in restricting meat consumption in the state. It is likely that vegetarians consume more milk to meet their protein requirements. The proportion of milk-consuming households increased from 70 per cent in 1993-94 to 81 per cent in 2011-12. India is the largest producer of milk (146 mmt in 2014-15), although per capita availability (322 g/day) still remains low. Internationally too, among countries with comparable or even lower per capita incomes, India has the lowest level of per capita meat consumption — 2.9 kg in 2015, of which 1.7kg/ capita is poultry meat (see graph: Total annual per capita meat consumption). Pakistan’s annual per capita meat consumption is about four times that of India; the country has a lower per capita income than India. What do these numbers indicate for food and nutritional security? Indians draw only about one per cent calorie-intake and three per cent protein-intake from eggs, fish and meat. Given the high incidence of malnutrition in India, especially among children, this is somewhat worrisome for nutritionists. Will government policy promote egg or meat consumption for better nutrition? The chances are dim. But the government can give a fillip to poultry consumption by reducing import duty on chicken legs from 100 per cent to say 20 per cent. Meat consumption will increase primarily through private sector initiatives such as of KFC and McDonald’s, which can ensure food safety requirements are met. Modernised, well-equipped abattoirs will also help as they have in making India one of the largest exporters of buffalo meat. Milk and milk-products can be promoted by cooperatives with support from the government. Further, since chicken rules the roost, not pork or beef, the feed pressure will be much less in India, as chicken is a comparatively more efficient convertor of energy with feed-to-meat ratio of 1.6:1 compared to 5:1 for pork and 7:1 for beef. This, coupled with low levels of meat consumption, will keep demand for feed food subdued. While the trend towards non-vegetarianism is increasing, vegetarians are certainly more benign to the planet’s environmental health.